Simply select a main ingredient, choose from the dishes made with that ingredient, and Beer Sommelier will display a description of the dish and a list of beer styles that will provide a suitable compliment. Beer Sommelier is the perfect way to plan a beer and cheese sampling party or a multi-course beer dinner. Next time you’re at the grocery store, buy your food first, then take out your iPhone for guidance in selecting the best beers to pair with your meals. 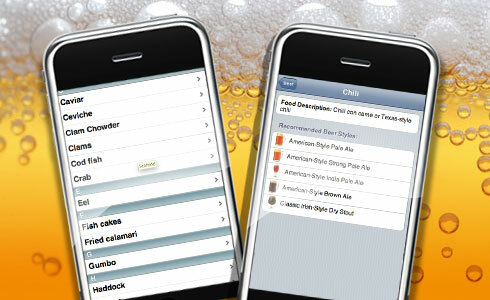 Start utilizing Beer Sommelier at restaurants to choose an appropriate beer to accompany your entrée. If your local restaurant or store doesn’t carry a style you’re looking for, request it from the manager, as they can easily order it from a distributor. Want to see some examples of each style? Jump over to the Product Search page on GreatBrewers.com to browse through commercially available beers of any style and even track them down at local retailers (not available in all locales). Maximize your enjoyment of great food with Beer Sommelier, a quick, easy, and fun way to select the best beer style to accompany your next meal. Created by Eric McKay and Jingsheng Wang for GreatBrewers.com.